The baseball season is off to a snowy start with all the winter weather Cannon Falls is seeing. 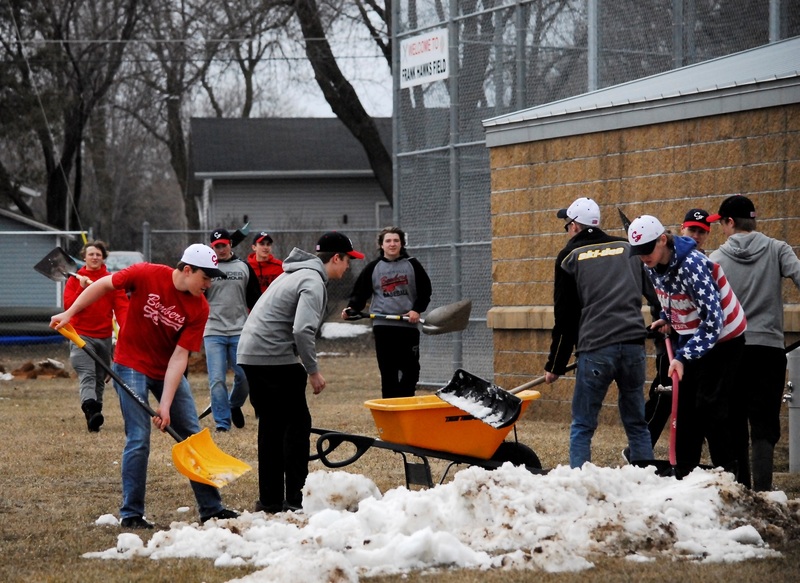 The boys of the baseball team shovel snow off of the field before their upcoming game. On February 2, Punxsutawney Phil discovered that his shadow was following him, signaling another six weeks of winter. Now, here we are 10 weeks later, and spring has sprung at last! Well, that is if one considers a 13 inch pile of snow the blessing of spring. With all of this powdery interference, the Bomber Baseball team has spent more time shoveling snow off of their field than they have actually playing games. Already, games are getting stacked upon each other, with four games scheduled for this week. But even still, the first game, if not the second have already been postponed further. Assistant Coach Keith Meyers comments, “I’ll be really excited when it stops snowing and it gets to be 55 degrees or warmer everyday. But, every year is a new year… and it’s going to be exciting to see what the juniors and seniors for this year can do.” And he will have plenty of chances to do so as soon as the snow melts for good, with 3-4 games scheduled each week. So while it may still look a lot like Christmas, everyone is anxious for the real Spring to awaken from hibernation and bring baseball back to John Burch Park. Phil may have crawled into his hole looking to escape six weeks of snow, but he should have doubled down on his bet, because it’s almost been twice as long, and more snow is forecast as on its merry way.